2017 is here, a year so prime-numbery that if it divides a*b then it either divides a or it divides b. I promise that's as mathematical as I'll be today. Anyways, when it's a new year, the time is ripe for me to look back on the year just gone, in a format exactly the same as the way I've been doing since... gosh, 2006. Lots of questions. Lots of answers. Here goes. Joined a drama group, performed in a play, did a sermon, made a tagine, drove north of Nottingham (in fact, I broke my record three times: Yorkshire, the Lake District & Edinburgh), went to the Edinburgh festival, got Netflix, managed two people at a time, went to a wedding reception but the not the wedding itself, started a podcast, bought chickpeas deliberately, played Settlers of Catan, went to a Champions League match, ran 5k, ran 10k. The problem with doing this thing every year is that my New Year's resolutions are always down in black and white. One of the things I said last year was that I'd stop using my laptop in bed; I managed for a while - and it did mean I got more sleep - but soon reverted to old habits. Ah well. I haven't made any resolutions this year, but I am going to start running again from tomorrow (having kept it up, three mornings a week, for much of last year until injury made me stop in late November). I am also keen, as I am every year, to spend more time praying and reading the Bible - ask me how that's going, when you see me. Of course. Pride of place, this year, goes to the latest Rawling child, on the basis that he was almost called Colin. Well, he was born one day after my birthday, and Ben assures me that, had he been a day earlier, there was a 90% chance he'd have shared my name. Not sure how on board Kate was with that. Anyway, since his name isn't Colin, there's probably no point revealing it. I drove to Scotland with Ant, a semi-recreation of our hitchhiking adventure of 2006, which you might have read about on this page. But I think that was the only time I left England in 2016; I don't even remember popping over the border to Wales. This might help to explain why I'm not too worried about restrictions on movement for UK residents in Europe. Hmm... everything I wrote last year still seems to apply: a new pair of jeans, curtain tie-backs, and glasses that aren't bent. Since those glasses were bent when someone - probably me - stood on them on a plane in March 2014, I should really get new ones soon even if they weren't broken. My theatrical debut as a vicar in Beyond a Joke will live in the memory - although our second night was comfortably the best of the three performances, so perhaps I should focus on that one, which was 10th June. Also, 9th April was Jason & Clare's wedding and an important day for me. Finally, the day that Ant & I re-arrived in Edinburgh (18th August) was pretty memorable, not least because it's been documented in photographic form. All the running, I'd say. It's an understatement to say that I'm not a natural runner - my skills and interests lie more in the area of sitting - so it felt like a great achievement to get up to running 5k. Then, having run 5k a few times, I thought I might as well keep going, and within a few weeks ran my first 10k (in 55m 08s). Unfortunately I only bought proper running shoes several months into doing this, which I assume was the reason that I was in quite a lot of pain and had to stop running for a bit. That 'a bit' has last about five weeks, so I hope I can get back into it OK tomorrow. I also had some crossword-related achievements, getting involved in clue-setting competitions (the Sunday Times and CCCWC) and managing to chalk up a few wins. I also had some crossword-related failures, most notably getting a word wrong in the Times National Crossword Championship in October. The word 'ichneumon' - a type of mongoose, you know - is now seared into my memory. However, I actually regard the day as reasonably successful, as I was much faster than I'd been in 2015, and would have made the final if I'd got that word right. The crossword failures I'm more disappointed about came in the Listener crossword, where I got 48/52 right in 2015 but messed up quite a lot more in 2016 (I stopped keeping track after my sixth mistake). More checking needed in 2017! On the bright side, I had a great time at the annual Listener dinner (which I wrote about here) and hope to make many more appearances there. Possibly the personal failure that annoyed me most, though, was in the BAS quiz: after a run of victories we missed out by 1.5 points in 2016, because I failed to stick to my guns in a few answers (and if that sounds like I'm actually trying to pass the blame, I assure you it doesn't feel that way). Other than the aforementioned running injury - gosh, I'm so sporting - nothing of note. A few colds and stuff, I imagine. And I've got holes in most of my socks. I'm pretty pleased with having a Netflix subscription. While the film selection is not as extensive as I'd hoped, there have been some gems I wouldn't have otherwise seen, and the TV choice is pretty great - originally I subscribed in order to get access to Daredevil, and you'll have seen that I was recently rhapsodising about Gilmore Girls. In terms of tangible things... er... running shoes? I don't know. But I can tell you the worst thing I bought in 2016: the 'mega sours' from Gretna that destroy the inside of your mouth and are currently in my car, no doubt acidicly searing their way through to the engine. In 2016 I smashed my record for wedding attendance, celebrating the nuptials of Sarah & Felix, Jason & Clare, Steve & Laura, Lucy & Cameron, Nick & Karen, Anna & Zemian and Jonty & Abi. (To be clear, their marriages are what I'm suggesting we should celebrate. Not the fact that I turned up). Also worthy of celebration is Simon, who has successfully applied for a new job and will be starting soon. And let's not forget Nobel laureate Bob Dylan. We should also celebrate Sir Andy Murray, newly-knighted best tennis player in the world, proudly sponsored by my employers Standard Life... and what employers they are! (Please let me keep my job). Jeremy Corbyn and his supporters - I even became a registered supporter of the Labour party in order to try to replace him with (the frankly no less depressing) Owen Smith. Staying political, there has been no one more depressing or appalling than Donald Trump, although almost everyone involved on either side of the EU Referendum certainly tried their best. I've also been fairly appalled by Wolves this season, as they've toyed with relegation despite having received significant investment from a Chinese consortium in the summer. As usual, the mortgage. I have also continued my, er, investment in Funko figurines, which are slowly taking over the house. I also spent significant amounts of money getting an exhaust sensor replaced in my car, which on the positive side stopped the 'check engine' light from showing, but on the negative side probably wasn't worth the vast riches it cost me. Also, with those seven weddings this year, wedding gifts were a significant expense (well, they weren't. Sorry to the three or four couples who didn't get anything from me. My bad). Listen, review questions, you don't know me and I don't know you. But I should tell you that I don't get really x 3 excited about much. However, I was excited (like a fool) by Euro 2016 - watching many games in the Eastfield Inn, aka the Palace of Goals; also catching up with Jay & Becky to watch England vs Iceland. I forget how that one finished - and I was excited to see my good friend Rich perform in two plays in Edinburgh. Staying theatrical, I was excited to perform in a play myself, and on a same theme I was delighted (though possibly not excited) to introduce Rob to live Shakespeare in the form of Hamlet at the Tobacco Factory. A success that was only slightly diminished by him telling mutual friends that he'd enjoyed watching Macbeth. Probably Taylor Swift's Blank Space: "Cherry lips, crystal skies". Not sure about that one either. I can say, though, that running didn't help me lose anywhere near as much weight as I thought it would. Ah well. Richer, I imagine. Helped by getting round to re-mortgaging in the spring. I should probably read more books. Simon always tells me so, anyway. There's a scene in Pixar's Inside Out where joyful memories are turned sad (represented as a change from yellow to blue) after being touched by Sadness. A couple of my best memories from 2016 are now tinged with regret, and I really wish that was something that I didn't do. Under the decoration of the chilli pepper-shaped Christmas lights that Simon got me this year. 21. What film quote sums up your year? You'll have noticed that, after years of question 21 being missing (and then being a question about me not noticing that question 21 was missing), I've added a new one. Fun, fun. Magic 8 ball says ask again later. I starting watcing Supergirl, and while it's not exactly good, it is good fun. Brooklyn Nine-Nine is, I think, the best comedy currently on TV, with New Girl also a strong sitcom staple. The return of Red Dwarf was also pretty decent, and Dave Gorman's Modern Life Is Goodish continues to be great. But, as you might have guessed, Gilmore Girls takes the prize today. Last year I mentioned that Mum had had a short story published, but that I hadn't read it yet. Now I have, and jolly good it is too. I've recently finished reading Bruce Springsteen's autobiography, written over seven years in an inimitable style, and I recommend it to anyone with an interest in his music. I've also re-read a bit of P. G. Wodehouse, which is unfailingly excellent. I don't listen to new artists much these days, but I did buy albums by Bastille and Fun., which were both pretty good. I always try to make the effort to meet up with university friends, and I'm pleased to report that 2016 was a bumper year in that respect: I had the great pleasure of seeing Ant, Charissa, Christine, Dave, Dom, Ellie, Guy, James, Jason T, Jason Y, Jen, Jez, Larry, Mark, Matt, Rich, Rob, Sinead, Sophie, Steve & Tom, and most of them at least twice. I even got to see Warwick campus again, and swing by Westwood Road to see the old homestead. In non-university meet-ups, I had the pleasure of welcoming Dave, Victoria & Olivia here for a barbecue and a zoo trip, and I hope to be able repeat the experience again now that their family has been extended by Leo. Unbroken glasses. But, more significantly, tickets for Harry Potter and the Cursed Child... I spent 12 hours trying to get them, got all the way to the website, and it then crashed. But I'm sure they'll make a film, or something. As ever, I won't step on the toes of the Coddies by mentioning 2016 releases here (you can check out my Twitter account @colinjthomas to see the Coddies nominations). However, other films that I saw for the first time in 2016 and particularly enjoyed include: The Paper, 10 Years, Nick & Norah's Infinite Playlist, The Verdict, Bicycle Thieves & Paddington. For our 31st birthday Simon and I spent the weekend at an Air BnB in Ashton Keynes. We explored the delights of the town, played various games and had a fine pub meal. Back in Bristol for the day itself, I went to work in the day and then to a meeting on church finances in the evening. Party time! I'm trying to think less about the things I don't have. So let's leave that one. Although I would have liked to have known more about mongooses. Are there really people who can genuinely answer this question? And answer it differently ever year? The mind boggles. Er... I bought a pretty decent raincoat. Although that might have been in 2015. I do a lot of crosswords. Melissa Benoist as Supergirl. I think this means I appreciate strong women, and am therefore a wonderful paragon of gender equality. Or possibly I just like smiley blondes. Oddly, I didn't really get too energised by the Brexit debate: I was on the fence for a long time and, as mentioned above, so demoralised by both sides of the argument that I didn't dive in too deeply. The aftermath has been no picnic, though, with both sides continuing to be divisive and dishonest. Across the pond I have been astonished and saddened by the rise of Donald Trump, and - to cap it all - in the Bristol mayoral election I voted for the guy who came last. But, oddy, the political issue that stirred me the most might well have been the junior doctors' strike. Joining a drama group has meant I've made quite a lot of new friends this year: I had the pleasure of appearing alongside Karen, Nick, Ollie, Andy, Di, Sandra & Emma in the play, and got to know various others through the group, including through our anniversary celebrations in December. To round of the year, I then went to Karen & Nick's wedding a few days ago. Other people I met for the first time this year were Sarah, Laura & Clare, the girlfriend, fiancee & wife of Rob, Steve & Jason respectively. Last year I mentioned that I was going to try to do things that scare me, and I did manage a few, including the play, and the sermon (on crosswords... and Palm Sunday). The lesson I'm learning is that, although those things are scary, they are worth it: the things I tend to regret are the opportunities I didn't take. I'm not sure that knowing this has helped me improve in this respect, though. It's time for the Coddies! For those of who are new here, the Coddies are the film awards I dish out at the end of each year, basically the equivalent of the Oscars. To be in contention for a Coddie, either the film must have been released in the UK in 2016, or I must have watched it on general release during 2016 (i.e. this includes films that were released towards the end of 2015 but which I didn't get round to seeing until the new year rolled around). DVDs and streamed films count, so long as their release date was 2016. And - new rule for this year - a film can't be in contention if it was already in contention for a previous year, so Star Wars VII can't make a re-appearance this time round. Right, I think that's all the rules. Seems to take longer to explain every year. There are 45 films for me to pick from this year, comfortably a record - my previous highest, in each of the last two years, was 30 - partly thanks to Netflix, Colony (an online film streaming service), free Times screenings, and my relatively recent lack of concern about seeing films by myself. Since I've confined myself to six nominations in each of the main categories, and four in the lesser ones, there are some films I very much enjoyed that didn't manage to garner any nominations at all: Race, War Dogs, The Magnificent Seven, The Man Who Knew Infinity among them. Winner: Spotlight - it's not very imaginative to go for the film that won Best Picture at the last Oscars, but this is a wonderfully crafted and understated film about journalists investigating child abuse in the Catholic church. The cast is second to none, and while there are moments of drama, the screenplay is careful to avoid hyperbolic revelation in favour of quieter, stronger moments. 2nd: Creed - the best Rocky film since Rocky, it is good to see the series return to strong character drama after too many formulaic sequels. Director and cast are all destined for great things. 3rd: Captain America: Civil War - the dialogue is much weaker than when Joss Whedon was running the show, but the Russo brothers have put together the best MCU film in a while: the airport scene is the definite highlight, and the whole bodes well for the future. 5th: Room - this was hard to watch, particularly gruelling scenes early on, but with a stand-out performance from Brie Larson and a strong screeplay, it is very powerful. I have never cried so much in the cinema. 6th: Rogue One - it doesn't hit the heights of The Force Awakens, but as a low-level tale of a rag-tag band of rebels it fits neatly into the Star Wars saga and has much to offer for fans of the series. 2nd: Bryan Cranston (Trumbo) - although the story of the eponymous screenwriter is rather too blunt in its depiction of the Hollywood blacklist, Cranston's performance is wonderful and demonstrates a dramatic depth that I'd never come across before (having not watched Breaking Bad). 3rd: Leonardo DiCaprio (The Revenant) - well, he's finally got his Oscar, hasn't he? DiCaprio goes full-swing into this, grunting and scrabbling his heart out, and he does a great job. Now he can relax. 4th: Michael Keaton (Spotlight) - like everyone else in this film, Keaton is on fine form, showing that his Birdman performance was no fluke. 5th: Miles Teller (Bleed for This) - he's not helped by some drab direction here, but Teller's carefully chosen career path continues to be a success. Here he plays a boxer making a gruelling return from neck surgery, and the physical similarities to De Niro's Jake LaMotta are almost matched in performance. 6th: Taron Egerton (Eddie the Eagle) - in a comedic role that almost always lands on the right side of mockery, Egerton manages to find dramatic depth in a real-life story that probably didn't actually have any. Winner: Brie Larson (Room) - she's been the next big thing for years, so it's wonderful to see her potential fulfilled and abilities recognised (she won the Oscar for this role). Playing the 'Ma' of the film, who was kidnapped and kept locked up for years, this is a complex performance - although she was at least as good a couple of years ago in Short Term 12, which I strongly recommend. 2nd: Kate Beckinsale (Love & Friendship) - this Jane Austen role could have been invented for Beckinsale, and vice versa. The humour is judged perfectly; the biting sarcasm delivered with an effected innocence throughout. In another year the Coddie would have been hers. 3rd: Lily James (Pride & Prejudice & Zombies) - this adaptation did not do well at the box office, and it is certainly flawed - the third act in particular - but it is also very rewarding, James's performance in particular. She would grace any film version of Pride & Prejudice, and should go far. 4th: Amy Adams (Arrival) - this is the latest strong performance from one of the most bankable actors in Hollywood, as she gives dramatic depth to a very thoughtful sci-fi film. 5th: Meryl Streep (Florence Foster Jenkins) - I must admit that I saw too much of Hyacinth Bucket in her interpretation of the title character, but it was a strong performance nonetheless. 6th: Felicity Jones (Rogue One) - she's good in everything she's done, and in this film she adds 'action star' to her list of accomplishments, also bringing an emotional depth not previously seen in Star Wars. Winner: Denis Villeneuve (Arrival) - there are bigger films in Villeneuve's future - he's directing this year's Blade Runner 2049 - and his work on Arrival is a great demonstration of his abilities on a large budget. This is a thoughtful sci-fi, and while it borrows from Contact, it has many ideas of its own and is the better film, in my view. The visuals and the narrative direction are both unique and well-devised. 2nd: Alejandro G. I��rritu (The Revenant) - a glutton for punishment, I��rritu made this film entirely using natural light (apparently), and tells the sprawling story of one man's struggle with injury, pain and death. I preferred his work on Birdman, but he is clearly a director to be taken seriously. 3rd: Taika Waititi (Hunt for the Wilderpeople) - I always think that comedy directors are undervalued in awards season - see Edgar Wright, in previous years - and Waititi may have to wait for recognition, but he has produced something wonderful here. 4th: Sebastian Schipper (Victoria) - the film - recommended to me by my friend Andrew, who ranks it as his favourite of 2016 - was genuinely filmed in a single take. This is impressive enough in itself, but he also manages to crank up the tension remarkably in this tale of a night of crime gone wrong. 5th: Ryan Coogler (Creed) - another director who has great things ahead of him, he had the gall to take on one of the biggest franchises of the last century and breathe fresh life into it. A triumph. 6th: Tom McCarthy (Spotlight) - helped by a stellar cast, the understated direction is integral to the success of this film. Winner: Hugh Grant (Florence Foster Jenkins) - you won't believe how good Grant is until you see him here, playing a layered and complex character and more than holding his own alongside Meryl Streep. The character is not entirely sympathetic, nor is he the villain of the piece, and Grant's charms have never been more perfectly deployed. If there had never been Four Weddings, we might have got a career of this. 2nd: Liev Schreiber (Spotlight) - another actor who has never, in my viewing experience at least, reached these levels before, Schreiber achieves a lot with a little. As the editor of the Boston Globe, he is calm and still throughout but manages to convey strong underlying emotions, as well as his sense of being an outsider. 3rd: Sylvester Stallone (Creed) - while there may have been a touch of nostalgia in the awards and nominations he received, this is a good reminder of Stallone's acting chops: he clearly loves the boxer he created in the 1970s, and if this is his last time playing Rocky then it's a great way to bow out. 4th: Mark Ruffalo (Spotlight) - excellent as ever, Ruffalo had more direct drama to get his teeth into than some of his cast-mates, and it couldn't have been given to a better actor. It's only a matter of time before he gets an Oscar. 5th: Robert Downey Jr. (Captain America: Civil War) - although this was his seventh time in the role, Downey clearly relished finding something new in his portrayal of a man questioning the impact of his actions. This is up there with his performance in Iron Man 3, and the strongest acting in the film. 6th: Sam Neill (Hunt for the Wilderpeople) - playing a gruff sidekick in this comedy, Neill has more emotional weight than anyone else in the film, and just edges out the likes of Jeremy Irons, Ethan Hawke and Jason Sudeikis in this category. Winner: Rachel McAdams (Spotlight) - there were no stand-outs in the supporting actress category this year, for me, but it's difficult to fault McAdams' performance here. This is her second Coddie (after The Time Traveler's Wife), and eventually I'm sure she'll get an Oscar - particularly if she takes a role that's more ostentatiously dramatic than this one. There are, though, a couple of powerful moments that she plays beautifully, including one where she doesn't need any words. 2nd: Tessa Thompson (Creed) - she provides great support as a musician who develops a romantic relationship with the title character. She will appear in this year's Thor: Ragnarok, and will hopefully continue to find meaty roles to develop into. 3rd: Tilda Swinton (Doctor Strange) - one of the more unexpected turns in recent Marvel films, Swinton sidesteps the, frankly, racist origins of the traditionally Asian character, bringing light and strength to the character. 4th: Anna Kendrick (The Accountant) - this is Kendrick's best performance in years, and while the screenplay doesn't do her any favours - she disappears for almost all the third act - there is one scene in particular where she and Ben Affleck bounce excellently off each other. 5th: Katherine Waterston (Fantastic Beasts and Where to Find Them) - captivating as soon as she appeared on screen, Waterston is an excellent foil for Eddie Redmayne in this Harry Potter spin-off, as well as forming half of the love story that I hope will be given more focus in future films. 6th: Danika Yarosh (Jack Reacher: Never Go Back) - as the teenage girl who may or may not be Jack Reacher's daughter, hers is the best performance in the film, getting more from the character than was on the page. Winner: The Jungle Book - a remarkable achievement, creating a whole world of CGI animals with only one human character in the film, this is another landmark film in terms of visual effects. 2nd: Doctor Strange - MCU effects are always strong, and this film brought more to the table with magical dimensions fully realised. 3rd: Rogue One - the re-creation of Peter Cushing was not quite perfect, but it's a big step forward and the battle scenes were tremendous. 4th: Independence Day: Resurgence - the film might have been terrible, but it wasn't for lack of budget. If only the actors had shown so much animation. Winner: Whit Stillman (Love & Friendship) - I must admit I've not read the original short story, but it was significantly developed by Stillman into a screenplay that truly fizzes. Most Austen adaptations struggle when they move away from her text, but not in this case: it is the best film of her work in many years. 2nd: Emma Donoghue (Room) - adapting her own book, Donoghue has created a powerful screenplay that only loses some of its fervour when the escape is complete. 3rd: J. K. Rowling (Fantastic Beasts and Where to Find Them) - although this is allegedly an adaptation, in reality it is a brand new story and thrusts us into a world we've not really seen before. I look forward to seeing more of what Rowling can create with these characters. 4th: Charles Randolph, Adam McKay (The Big Short) - I was a little underwhelmed by this film, which was an awards season favourite, but it had an undeniably intriguing screenplay: I particularly enjoyed the offbeat ways in which they explained complex financial concepts, and the levels of outrage that seeped through the story. Winner: Josh Singer, Tom McCarthy (Spotlight) - as I've said above, this was a beautifully understated film dealing with horrific real-life events, and the screenplay does a wonderful job of blending drama with the realities of investigative journalism. 2nd: Ryan Coogler, Aaron Covington (Creed) - this screenplay breathes new life into the Rocky franchise, managing to blend new - and very different - characters seamlessly into a familiar world. 3rd: Torsten Wenzel, Florian Gallenberger (The Colony) - this film deserved to be seen more widely - there were some great performances, which only just missed out on nominations here - telling a compelling story, even if it may have taken liberties with the facts. 4th: Nicholas Martin (Florence Foster Jenkins) - this real-life story of a terrible singer who performed at Carnegie Hall may have been a gift to a screenwriter, but Martin finds remarkable depths to his characters to create an emotionally involving story. Winner: Batman: The Killing Joke - as usual, I only saw one animated film. This one was a pretty straight adaptation of the well-known graphic novel, but with a controversial sub-plot tagged on the front. Winner: The Beatles: Eight Days a Week - for only the second time in the Coddies, I saw a documentary. This look at the Beatles' touring years is nicely done, but doesn't have anything new to say or reveal. 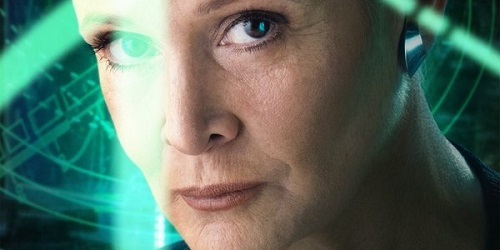 When news came through that Carrie Fisher had suffered a heart attack, and again when she passed away a few days later, my first thoughts were all about Star Wars. Had she filmed all her scenes for Episode VIII? Had the plan been for her to have a large role in Episode IX? Would they try to bring back Harrison Ford, somehow, to take her place? Having had these thoughts, I felt bad: a human life had ended, and here was I worrying about a couple of movies. It was the same when Robert Jordan, author of the Wheel of Time series, announced that he had a terminal illness: my first thought was a hope that he'd survive to finish the series (he didn't); my second thought was guilt. But, actually, I'm reconsidering. I never knew Carrie Fisher or Robert Jordan - or any of the litany of names who died in 2016 - in any way except through their work. If Carrie Fisher hadn't been Princess Leia - if Alan Rickman hadn't been Hans Gruber, if Gene Wilder hadn't been Willy Wonka, if David Bowie hadn't been Ziggy Stardust - they would never have entered my sphere at all. They would have just have been people who lived and who died. And while that's not something to be flippant about, it's a simple fact that millions of people die every year without me noticing, because they were never in Star Wars. And this is partly why I feel a bit odd about the outpouring of grief that meets the death of somebody in the public eye. It's even stranger when the death is of someone I never really cared about in life: for example, I'm not a fan of the music of Prince and I've never read anything by Umberto Eco. Their deaths did not, if I'm honest, affect me at all. Which means that grief has become a function of taste. I'm not going to be silly enough to tell people how they should feel, but personally I have very rarely felt anything approaching grief when a public figure has died. Richard Whiteley, oddly enough, is probably the closest I've come. Part of me feels that grief, in fact, is not really earned in these situations: "Grief is the price we pay for love", as the queen once said, and she wasn't talking about the kind of love we feel for Terry Wogan. I have been fortunate enough not to lose anyone close to me, but I know people who have - people who have suffered true grief, including in 2016 - and making any kind of comparison feels insensitive at best. My response, when people I have truly appreciated have died, leans more towards celebrating their work and what it has meant to me. George Martin, Glenn Frey, Harper Lee, Robert Vaughn, Kenny Baker, Christopher Zeeman: they all passed away in 2016, and they all did work that I've enjoyed, but that's not - for me, who never knew them - a reason for sadness. It's an opportunity for celebration. What these people have in common is that their greatest works - the reason they are known; the reason they are celebrated - were already behind them. George Martin was never going to produce another Beatles; Harper Lee was never going to write another To Kill A Mockingbird. Even George Michael, who was too young to die, was not going to write another Careless Whisper. It is crass to even hint at ranking these things, so I apologise, but this helps to explain why I thought the most tragic death of anyone in the public eye last year was that of Anton Yelchin. In the first place he was only 27, and the death of a 27 year-old is always a horrible thing. And, unlike the members of the so-called '27 club' (Kurt Cobain, Jimi Hendrix, et al) who mostly died in a blaze of drink and drugs, Anton Yelchin died in a freak accident when his car rolled down the drive and crushed him. That would be devastatingly sad, no matter who he was. What makes it even sadder, though, is that his greatest works were not behind him: he had so much more to give to the world, and we will never see it. He will never get to do it. Instead of being remembered for the kind of brilliance he hinted at in low-budget films like The Beaver and Like Crazy - instead of following the path that should have led to him being one of the most respected actors of his generation - history will remember him mostly for supporting roles in the Star Trek reboots and the worst Terminator film. We have been robbed. The same is true of Alan Rickman. He was an excellent actor, of course, and his performances - Die Hard, Harry Potter, Sense & Sensibility, Love Actually, and many more - will rightly be celebrated for years to come. But the real sadness, for us, was that there was so much more that we will never see: as well as his acting, he was just getting his writing/directing career off the ground with 2014's A Little Chaos. How good a director could Alan Rickman have been? We will never know. We have been robbed. It may seem selfish to mourn people's deaths only in light of what they could have given us. I don't know, maybe it is. But it brings me back to where I started. If I love someone because of the joy their work has given me, it makes sense to me that the greatest darkness their death brings to me is the stemming of that joy. I wanted to see more films with Princess Leia in them, and now I can't. And that, surely, is enough to make anyone sad.